IceCube is a neutrino detector located right at the South Pole. Most of what they see are atmospheric neutrinos produced when cosmic rays hit Earth's atmosphere. Obviously, nobody would be freezing his off in the Antarctica for that. The goal of IceCube was always to catch neutrinos of astrophysical origin, thus inaugurating neutrino astronomy. Finally, last year they announced the detection of 2 neutrino cascade events, both with the same (within experimental uncertainty) 1 PeV = 1000 TeV energy. 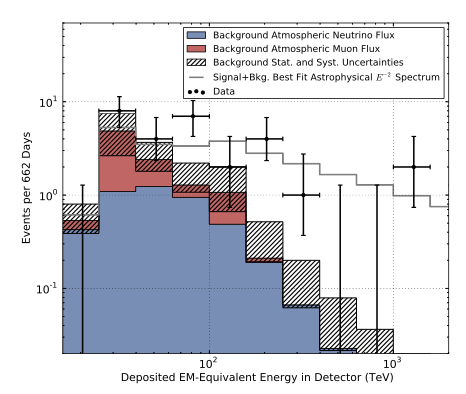 This is interesting not only because these are the highest energy neutrinos ever detected. 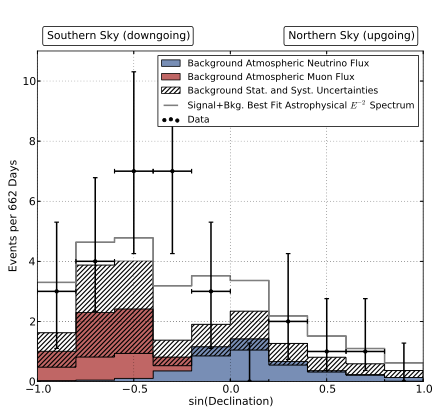 The main point is that the atmospheric neutrino spectrum is expected to drop off quickly at large energies, and is very unlikely (at about 3 sigma or so) to produce as much as two PeV events. The more recent development is that there is in fact more than just two events. 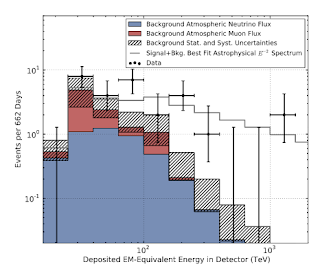 There appears to be a broad excess (quantified at 4.3 sigma) of 28 events above 30 TeV where only about 10 are expected from atmospheric neutrinos alone. The flavor composition in that range is consistent with 1:1:1 ratio of the 3 neutrino species, as expected for faraway sources because of neutrino oscillations along the way. All in all, there is little doubt that the neutrino spectrum measured in IceCube has a component which is harder than the one predicted for the atmospheric neutrino and therefore is most likely of astrophysical origin. One can dig out a few more interesting bits of information. The observed angular distribution of the ultra-high-energy events is compatible with an isotropic incoming flux. There seems to be a dip in the spectrum just below 1 PeV - no events are observed in the two bins between 0.4 PeV and 1 PeV. Finally, the spectrum probably has a sharp cut-off just above 1 PeV - otherwise several multi-PeV events should have been observed. All these more detailed statements are at this point not very significant statistically, but if they persist after future updates things will get even more interesting. Indeed, sharp spectral features are more tricky to explain in terms of known astrophysical phenomena, which are rather expected to produce a smooth power-law spectrum (typically assumed as 1/Energy^2). For particle physicists the natural question is whether these neutrinos could be the signal of annihilation or decay of dark matter in our galaxy. Dark matter would have to be made of PeV mass particles - more than is typically considered. But why not: any mass between sub-eV and Planck scale is equally plausible at this point. Of course, theorists have models for every occasion up their sleeves. On interesting proposal is that the two PeV events can be interpreted as a monochromatic neutrino line. This could arise if dark matter decays into a 2-body final state containing at least one neutrino (dark matter annihilation with a large enough cross section is difficult to realize for such a heavy mass). To explain the observation of 2 events in IceCube, the life-time of dark matter should be about 10^28 seconds or 10^21 years - much longer than the age of the Universe and compatible with all existing constraints. 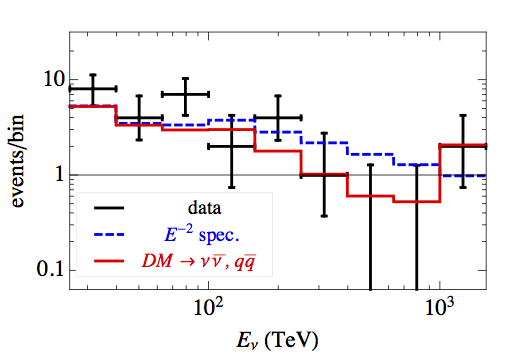 The presence of the continuum excess around 100 TeV makes the picture more complicated... but not necessarily unrealistic. 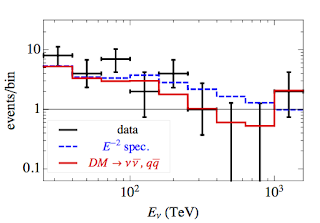 It is perfectly conceivable that dark matter has more than one decay channels, for example 10% branching fraction into 2 neutrinos, and the remaining 90% into quarks. The former would be responsible for the PeV events, and the latter would produce neutrinos with smaller energies from the hadronic cascades, which would explain the broad feature near 100 TeV. This paper shows that a general scenario of this type can fit the data very well, somewhat better than the smooth 1/E^2 spectrum. So, as usual, the possibilities are endless, and we badly need more experimental input. The dataset analyzed so far corresponds to the 2010-2012 period, so there should be 50% more events already waiting in the pipeline. Most likely, it will turn out that these ultra-high energy neutrinos are produced by some boring astrophysical processes (although I admit that the boring astrophysics producing PeV monster neutrinos must be less boring than typical boring astrophysics). But, well, who knows, maybe this time they will hit the jackpot? For more details and naked photos of Bert and Ernie, see this talk.